I have a love of chocolate - in fact I am addicted !! I love to share my love of chocolate (well it would be rude not to), particularly at Christmas, and I have designed this super sturdy treat box to hold three Ferrero Rocher chocolates. 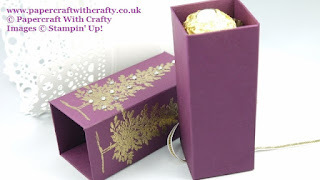 These boxes are perfect as Dinner Party box treats for your guests or even for hanging on your Christmas Tree. 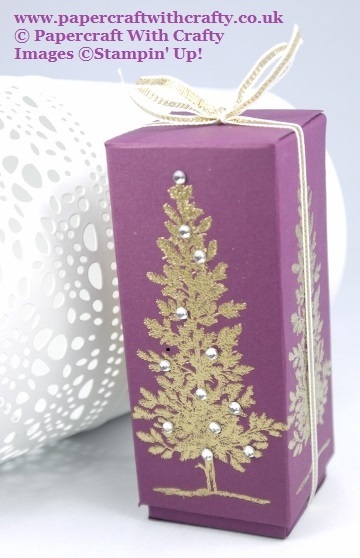 I adore Gold and Silver embossing and the richness of the Gold heat embossed onto beautiful Blackberry Bliss cardstock is particular striking, coupled with the additional beautiful rhinestone embellishments for that extra bit of bling. The Lovely as a Tree stamp set was absolutely perfect for this box design.